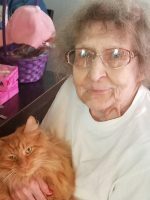 Gloria Lucile Carruthers, 90, of Claymont Health and Rehabilitation at Uhrichsville and formerly of Dover died peacefully Tuesday afternoon, August 14, 2018 while in the care of Community Hospice House at New Philadelphia. Gloria was born November 12, 1927 and was the daughter of the late Robert W. and Mary Ann Carpenter Strock. Gloria was a longtime member of Dover Methodist Church and Life Bridge Church at Dover. She is survived by two daughters, Kathleen Carruthers of Uhrichsville, Rose Carruthers of Dover; a son, Kenneth Carruthers of Dover; two granddaughters, Megan Carruthers of New Philadelphia and Samantha Carruthers Thornton of Newcomerstown; a great-grandson, Tyson Malcuit of New Philadelphia; her sister-in-law, Dorsey Strock of Bowerstown; a longtime friend, Dennis Bake of Bowerstown; as well as numerous nieces and nephews. In addition to her parents, Gloria was preceded in death by her husband, Robert Vernon Carruthers; her brothers, Robert and Richard Strock, and Warren Shlafley; and a sister, Thelma Geltz. In keeping with her wishes, her body is to be cremated through the care of Geib’s Tuscarawas Valley Crematory. Inurnment services will be conducted Tuesday, August 21, 2018 ay 11 AM in East Lawn Cemetery in Sugarcreek with Pastor Chet Miller-Eshleman officiating.